Parking permits are required to park in all St. 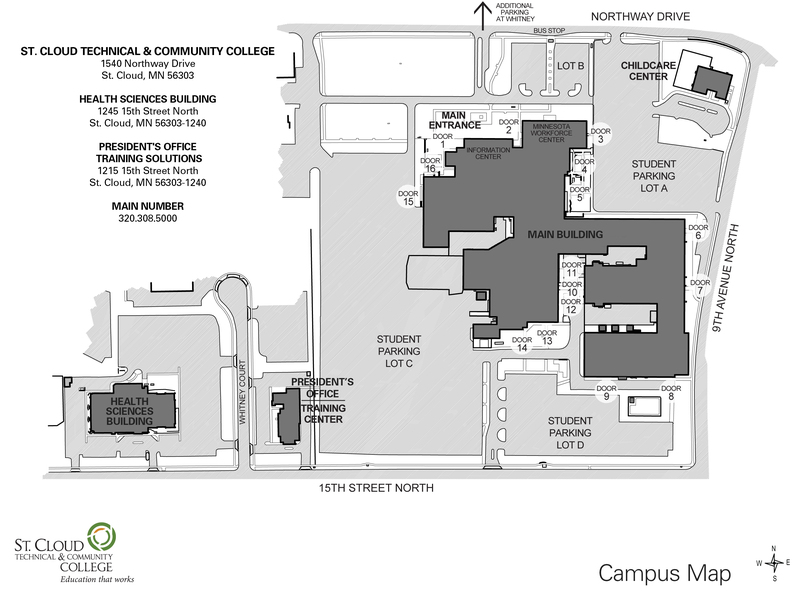 Cloud Technical & Community College owned and leased properties with the exception of B lot. B lot is strictly for Workforce Center clients only. An access/parking fee is included in the cost of tuition & fees at $3 per credit.Distance education courses requiring no campus visits will not have that fee attached.Daily parking permits may be purchased in the Business office for $2.00 up to one day in advance only. Faculty, Staff and Workforce Center employees must purchase their own permit each year at the following prices: $90.00 for an annual permit or $45.00 for a fall or spring semester permit, and $30.00 for a summer semester permit. Adjunct faculty rates will be based on credits taught each semester.This access/parking fee is reviewed annually and subject to change. Motorcycle permits will be issued at no extra charge provided students have paid their tuition and meet the access/parking requirements.Permit should be displayed within 12” of license plate and be visible. One permit may be used for multiple registered vehicles; however, additional permits may be purchased for $10 each. Permits must be hung from the rear view mirror so they can be easily viewed.IF YOU FORGET YOUR PARKING PERMIT IN ANOTHER VEHICLE, A DAILY PERMIT MAY BE PURCHASED IN THE BUSINESS OFFICE FOR $2.00. Parking lots will be patrolled and parking violations will be ticketed.Unpaid parking tickets will be recorded and will prohibit a student from registering for classes and obtaining transcripts. PERMITS MUST BE HUNG FROM THE REAR VIEW MIRROR SO THEY MAY BE EASILY VIEWED. Registering your vehicle is required for all SCTCC students, staff, and faculty. In the case of an emergency involving your vehicle, Public Safety will use the registration number to locate and notify you of the emergency. All vehicles on campus driven by students, faculty, and staff must be registered with the college online at https://webapps.sctcc.edu/parkingregistration/ . Upon registration, you will be issued a SCTCC parking permit that must be displayed by hanging on the rearview mirror. If you drive more than one vehicle to campus on a regular basis, each vehicle must be registered and will be issued a permit that must be on that vehicle. All vehicles must be registered within the first two weeks of a semester. All vehicles registered or parked on campus must be properly licensed and insured. Unregistered vehicles are subject to receiving a citation from Public Safety. Vehicles may be registered at: http://www.sctcc.edu/parking-permits . You can then pick up your parking permit at the Cashier Window inside Door 1 of the Northway Building during business hours once your registration has been submitted. SCTCC has enough parking capacity to accommodate its students, staff, and faculty. Although it may not be the closest space to your destination, there is plenty of space available. Please refer to the parking map located online at http://www.sctcc.edu/sites/default/files/Campus%20Map.jpg if you are unaware of the designated parking areas. You are not allowed to park in spaces that are designated with a sign for specific use unless it applies to you.Handicap marked spaces, visitor spaces, state vehicle spaces, and other reserved spaces are in effect 24 hours a day, seven days a week. Visitor parking is designated for guests only. Visitor permits are available at the Information Center. Misuse of Handicapped Parking fee is $200.00 as per the City of St. Cloud. Handicapped placard or handicapped license plate must be displayed to be eligible to park in a handicapped stall. Public Safety will call the St. Cloud Police Department to issue handicap citations. **NOTE** Students, staff, or faculty who have a handicap placard must also have an SCTCC parking permit. Visitors do not require an additional permit. the provision of services, public safety, or essential repairs. Any unauthorized vehicle parked in or blocks the use of a reserved stall (e.g., handicapped, state vehicle parking, etc.). Any vehicle parked on any surface not specifically marked for the legal operation of a motor vehicle (e.g., lawns, grass, sidewalks, vacant lots). Any vehicle displaying a counterfeit, stolen, altered, transferred, or otherwise fraudulent parking permit; or a permit issued due to false information given on the permit application. Any vehicle parked in any area marked "Tow-away Zone," etc. Any vehicle removed from impoundment without official release from SCTCC Public Safety. Any vehicle parked on SCTCC property, is not in operating condition, and has not notified Public Safety. Impounded vehicles will be towed by a bonded wrecker service. The owner/operator of the vehicle is liable for the costs of towing. Impoundment charges must be paid directly to the tow company for vehicles that have been towed. Vehicles towed by SCTCC will be towed by a company selected by the college. Contact information for the company that towed a vehicle will be provided by Public Safety by calling 320-308-3333. All immobilized vehicles that have not been released within 24 hours of application of wheel lock will be towed at owner’s expense. Penalties and/or fees will be assessed to the owner’s/operator’s account including any citation for violation at the time the vehicle is immobilized, the immobilization charges, and the tow charges. All vehicles immobilized with a wheel lock shall have a notice affixed to the driver's side window. This notice shall indicate the procedure necessary to release the vehicle from impoundment. Owners/operators of vehicles immobilized by wheel lock must contact Public Safety at 320-308-3333, or speak with us in person at the Public Safety Desk to discuss the procedure on how to get the wheel lock removed. Attempts to remove the wheel lock that result in damage to the wheel lock will result in appropriate fees being charged to the owner/operator’s account for the full cost of replacement. SCTCC is not responsible for damage to vehicles associated with the placement of the wheel lock on an impounded vehicle. A fee of $60 will be assessed for removal of wheel lock. You are required to drive carefully, cautiously following SCTCC traffic/parking rules and regulations. You are also responsible for all violations committed while your vehicle is in the custody of another person. You are responsible for any parking violation tickets issued to you. If you plan to appeal a ticket, it is your responsibility to appeal it within 5 business days. Failure to do so will result in the fine being charged to your account. You are responsible for obeying all State of Minnesota traffic and vehicle operation laws. Parking Appeals are to be submitted online at http://www.sctcc.edu/parking-appeals . Tickets must be appealed within 5 business days of the violation.Appeals received after the 5th business day will not be considered. The appeals committee will meet every other Tuesday from 2:00 p.m. to 3:00 p.m. during the academic year to hear appeals.The next scheduled Parking Appeal Committee meeting is posted on the online appeal form when you submit your appeal. There must be three members of the appeals committee present for business to take place. Individuals have the option to be present for their appeal. The committee will consider appeals on a first come, first served basis. You must report all motor vehicle accidents on campus immediately to Public Safety. Call Public Safety at 320-308-3333. A Public Safety Officer will record the necessary information, investigate the scene, and fill out the appropriate motor vehicle accident forms. If the accident was a hit-and-run, Public Safety Officers will recommend you file a police report with the St. Cloud Police Department. Official Public Safety Incident Reports regarding motor vehicle accidents on campus will be made available to your insurance company OR your attorney only.We do not hand out these forms to either party involved in order to ensure privacy of personal information. Payments will only be accepted at the Business Office during normal business hours Monday-Friday. The Business Office is located just inside Door 1 of the Northway Building. The Minnesota Workforce Center parking lot (Lot B) is strictly for Workforce Center clients only and vehicles in violation are subject to ticketing. We also ask that you refrain from parking in neighboring business parking lots out of respect to those businesses. Each business manages their own parking, and SCTCC student, staff, or faculty vehicles that park in a neighboring business parking lot may be towed by that business. Located inside Door 1 of the Northway Building.A visitor permit must be obtained from the Office of Admissions between the hours of 8:00am – 5:00pm M-F. Visitor parking located outside of the Door 1 entrance in Lot C.These spaces are marked with a visitors parking sign. Visitors to the President’s Office may obtain a special permit by contacting Karen Hiemenz at khiemenz@sctcc.edu , or by calling 320-308-5017. Any vehicle that is registered to or used by SCTCC faculty, staff or student, does not qualify to park in visitor designated parking areas. These vehicles must park in another general parking area or a permit lot. THE ACCESS/PARKNG FEE IS USED SOLEY FOR THE DEVELOPMENT AND UPKEEP OF THE COLLEGE’S PARKING LOTS, ACCESS ROADS, PARKING SECURITY, ASSOCIATED LIGHTING AND SIDEWALKS TO THE CAMPUS AND ADMINISTRATIVE COSTS ASSOCIATED TO ACCESS/PARKING. ALL STUDENTS AND EMPLOYEES, REGARDLESS OF WHETHER THEIR EDUCATION OR EMPLOYMENT INCLUDES ACTUALLY PARKING ON THE LOTS, BENEFIT FROM THE ESTABLISHMENT AND MAINTENANCE OF THE LOTS. IT IS AN EMBEDDED SERVICE THAT ALLOWS SERVICE PROVIDERS, STUDENTS, FACULTY, STAFF AND ADMINISTRATION, SECURITY, DELIVERY VEHICLES, ETC., THE ACCESS TO OUR BUILDINGS NECESSARY TO COMPLETE THE MISSION OF THE COLLEGE.